He’s a design student at Emily Carr University of Art and Design. He loves creating things, moving and shifting things, and repurposing materials to make new from old. 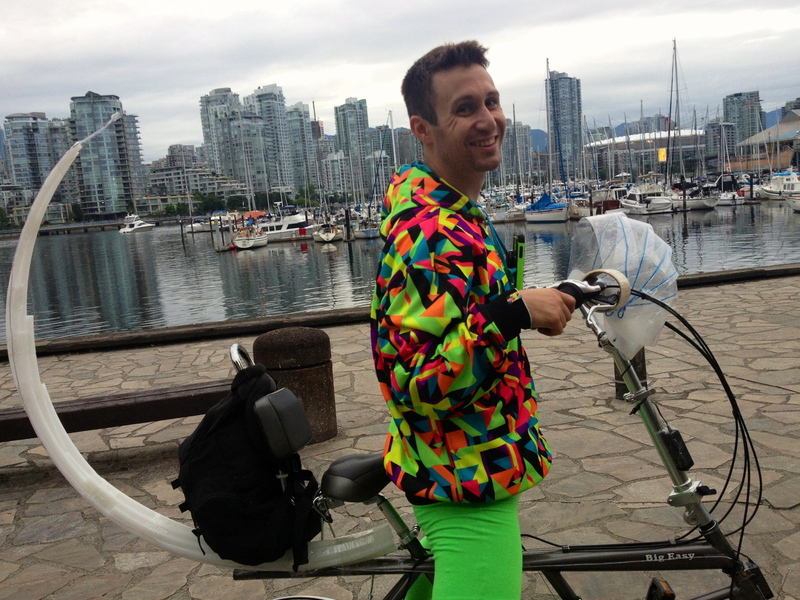 He and I ended up biking alongside each other on our way to the Bike Rave, which he helped organize. Five thousand of us biked along the water with speakers attached to our bikes in sync with each other, decked out in crazy costumes and smiles. It was spectacular. I knew he would be my stranger of the day when I saw him. And when I told him about the project he smiled what was debatably the biggest smile I have ever seen. He immediately welcomed me into his friend group and introduced me to them, all the while double and triple checking that they knew I was now a “part of the crew”. Whenever we biked past someone, Derek would smile and give them a high-5. His positive energy is contagious. Derek has done a bunch of really cool things in his life. He used to be a hip-hop/electronic music producer. He’s been a sculptor. He’s even a free-style rapper. I wanted to hear the magic myself. Derek: I could show you, yeah. Me: …Will you show me? And then he freestyle rapped in perfect rhythm, to the background beat, all while riding a bicycle! It was impressive. He said he’s trying out amateur stripping this summer. Apparently he had his first show the other night and it went really well. He told me about a mantra he followed while on exchange in San Francisco: “eat each meal like it’s a feast and live each day like it’s a vacation”. While he was there, he rode a motorcycle — something which he found really exhilarating. He believes that the closer you are to death, the more alive you feel. And that’s what draws him toward the adrenaline rush. I still can’t believe I learned all of this about Derek while we were on our bicycles (half pedalling, half dancing). What a fun night.